I was awoken around 4:30 this morning with a strong smell of smoke from the Lilac Fire. I thought it a good idea to find some information, but was amazed at how difficult that was – especially in the information age. I first tried online sources, in particularly Cal Fire and San Diego County Emergency services. Neither of them had updated anything since approximately 11:00 pm the night before. To some degree I get that, as they are likely very busy. However, while it seems that most emergency agencies have called in first responders, apparently those responsible for posting information and updates are not part of that group. No updates seemed to be posted over night. I then thought I’d check the TV news. Most local stations have news crews deployed on the edges of the fire. 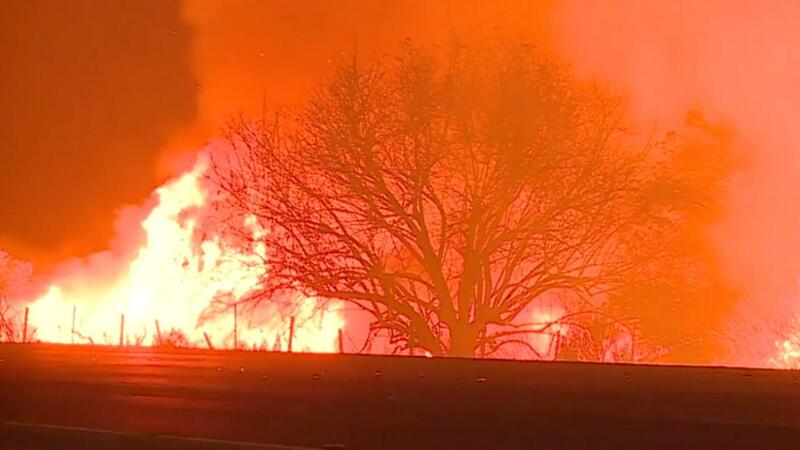 As I write this, it is about 7 am, and in the last 2 1/2 hours I’ve gotten literally no sense of what the current perimeter of the fire is, other than the last posted Cal Fire update from last night. Instead, I’ve been treated to a fair amount of melodrama, repurposed stories about good deeds that people have done, and my personal favorite, one of the news crews showing us how they threw some water from a bottle on embers of the roof of a house. Quite literally there has been no “news”, which by definition is “newly received or noteworthy information”. With all of the news crews deployed, could not the producers put together a rough update on the current perimeter and post that? Could not they update the overall direction of the fire? In other words, could they not take some of the data they undoubtedly have access to and provide some information from it? I now remember why I stopped watching TV news – because that’s largely what it isn’t. Returning to Cal Fire and our county emergency service, they similarly seem unable to take some of the data they have and post at least rudimentary information. Everyone is concerned about estimating acreage, but I ask, is that really relevant? Can’t they at least update the perimeter, the direction, maybe even the rate of expansion? After all, they know where the crews are and what’s going on at those locations, don’t they? I hope my colleagues in both the news industry and with emergency services review this event and consider what opportunities there are to generate real information on a regular basis. I feel that we can more quickly find out the latest outfit worn by the Kardashians than important information to help keep us safe. I was at the weekly meeting of the Kiwanis club I belong to this morning, listening to a presentation about the College Bound program within the Oceanside School district. During the course of the presentation, the topic of kids and their use of technology and social media came up. We were reminded that as parents we are in control, and should take away the phone, turn off the media, etc. I sat there sighing and nodding. Yes, my kids are on the phones too much. At the same time, in my professional career, I’ve spent the last several years crafting an IT strategy to enable employees to operate regardless of where they are located. There are still pieces to put in place, but we’ve been making good progress. The largest challenge I face is adoption of some of the capabilities. For instance, we have Skype available, but how can I drive adoption of the technology? Colleagues I’ve spoken with have indicated how empowering such a tool can be. One person I spoke with has now gone entirely remote as they are actively online with video and chat all the time. There is little advantage to being in the same office. Now, that is an extreme case, but a number of companies (and their employees) could probably benefit from less time commuting and coming into an office that can, at times, be quite distracting and wasteful. However, in my particular case, operating online in this way is entirely foreign. Most of the folks in my company are not comfortable operating in the virtual world to such a degree. They can handle email (the bane of all IT managers), but texting? IM? Video chat? Not at all. So, after the talk this morning, the dissonance of these two situations struck me. Perhaps we are really looking at this the wrong way. Kids are drawn to the online world. Yes, they can do wrong things there. They can waste time. But that happens at my office as well. In fact, there are some folks I work with who love to walk into my office to tell me something about their personal lives that I didn’t ask about, usually right when I’m in the middle of something. What if, instead of limiting the time kids spend on their devices, we teach them how to use them to become effective collaborators, and to become more efficient at accomplishing the “important stuff.” In some ways I see that happening without adult intervention. My youngest loves creating slime (if you have a 12 year old you probably understand, if not, be happy). So, she works with her friends via FaceTime and SnapChat to develop new recipes and variations. She is collaborating in a way that I can’t get my colleagues to. I plan on asking her how often, if ever, she does homework with her friends via FaceTime. My 20 year old takes a fair number of online classes at her university. I wonder how often she is in the same boat. I throw this out there as a conversation starter. I may think about this some more and decide that I’m completely wrong, as I’m not convinced that I’ve got this right either. Note: This has been updated from its original post in 2015. I will be upgrading some Ubuntu 12 servers in the near future and will be deploying Redmine 3 (upgrading from 2.2). In order to prepare for that, and because I needed a Redmine instance for a project I will be undertaking (an store management app to integrate with Square), I decided to do a full deploy of Redmine to an Ubuntu 14 server I had setup to use in a course I was teaching at UCSD. It had Apache, MySQL and PHP installed to support a BPM solution, so I would need to add RoR support to the server, and get Redmine running. Although this wouldn’t be fully parallel to what I will be doing in a couple of weeks, it would serve as a refresher for me, and alert me to things I need to be aware of. I was mostly able to follow the Redmine install documents, but there were a few exceptions that I wanted to document, as well as some additional pieces that the Redmine docs don’t really address. The first step is to get Passenger running. The instructions are simple and straightforward, and this installation worked just fine. Once installed, you need to install Redmine. The first question is about Ruby in your environment. I attempted to use RBEnv as that seems to be growing in popularity. After hitting a number of snags, I opted to uninstall RBEnv and switch back to RVM which I’ve had success with. I suspect that had I wanted to try for a bit longer, I could have ironed out the RBEnv issues, but I decided to move on. Basically what was happening was that I had first installed it in my home account, then realized that this would be problematic and located instructions for doing a multiuser install, as I want to run my app under a service account, not as my user. I should point out that I did all of this work with a “standard” user account that was also in the sudoers list. I believe that I will be able to effectively manage the upgrades over time with this approach. I followed the multiuser RVM installation instructions located here. Again, this is straightforward, just follow the instructions and make sure you are working in the multiuser part. After completing the install, create a Redmine user (this is after the whole Redmine install is completed) to act as a service account, and grant it the appropriate permissions. The account can be locked and will work just fine, so people cannot attempt to log on to your system if they guess the service account name. Once RVM is installed, you can install whatever Ruby you wish (or rubies). I installed 2.2.3, then made it the system default (RVM use 2.2.3 –default). I give the redmine user ownership of the files, tmp and log directories recursively as that user needs to write to those directories. Once that is complete, create a database for Redmine and select a user for this. As a matter of safety, I create a specific user to access the database, and limit connections to localhost only, for the Redmine user only. If you have PHPMyAdmin running this is a simple enough task. In general, and MySQL defaults to this, you shouldn’t be directly connecting to it from another machine. If such a thing is necessary, you should do it on an IP by IP basis, so that you are allowing just a specific IP. I have an implementation at a client where there is an integration between MySQL and another tool that requires a direct external connection for read only. I created a read only user, and allow it to authenticate only from that one IP address. Install both SVN and ImageMagick. The OpenID libraries are dependent on whether you want OpenID. ImageMagick is optional as well, but the default with Redmine is to use RMagick to handle images, and it will not install without ImageMagick. You’ll want images, so just go for it. There is one thing that won’t install with the RMagick gem, if you just install ImageMagick (sudo apt-get install imagemagick). You will also need to install a dev library by using sudo apt-get install libmagickwand-dev. At this point, you will want to install the MySQL libraries and drivers so that the MySQL2 gem will install correctly. Run the following. sudo apt-get install ruby-mysql libmysqlclient-dev (the old libmysql-ruby was a transitional package). At this point download Redmine. I used SVN and downloaded it to a directory in usr/local. Then I created a symlink to the directory in /var/www. From here, configure the database.yml file as directed in the installation directions, then install bundler (gem install bundler) then install the required gems using bundle install –without development test (you can exclude rmagick at this point, as well, if you aren’t going to use it). Without this, you will simply receive a list of items in the public folder. This appears to be Rails related as I have an older version of Redmine running the same version of Passenger, but on Rails 3 that doesn’t require this directive. Redmine 3, using Rails 4+ appears to have this requirement. This secures your application by not placing your secret key in any of the application files (it exists only at the OS level). Alternatively you can set secret_key_base: <%= ENV[“SECRET_KEY_BASE”] %> and load it from the profile of the redmine user (assuming that this is the user which will be running the application). Finish by creating the database schema, default data set, and setting the file permissions as indicated. If you are upgrading from an older Ubuntu version, vs. performing a clean install, make sure that you don’t have any passenger configuration items in your apache2.conf file (typically in /etc/apache2/). The passenger binary itself should be loaded as a module in Apache, and the PassengerRuby and Default user, although they can be defined in the apache2.conf should probably be specified within the virtual host definition. It wouldn’t hurt to keep things in the apache2.conf file, but by keeping it in the sites definition, the option exists to run different rails apps using different rubies and users. If, as I have had in the past, you have a legacy app, you can run it under a legacy ruby at the same time a newer app is running on the latest ruby. To determine the path to ruby, run the following command: passenger-config about ruby-command, then copy the path to the redmine.conf file as indicated. Enable the redmine site (a2ensite redmine), restart apache, and all should work. Enterprise architecture(EA), as a specific discipline, dates back to the late 80‘s. However, it has been very difficult for EA programs to gain much traction. Very often, the architecture program simply becomes focused on creating as-builts of existing applications and infrastructure. Indeed, unless you are starting a completely new endeavor, some amount of retrospective work will become necessary. Prospectively, EA programs fall by the wayside. My own experience with an enterprise architecture program supports that. I engaged with the group as I thought the modeling tools might be useful. It never occurred to me that the architecture group might be of use in engineering new systems. So, EA groups need to prepare and market themselves internally as resources to help facilitate new information systems engineering efforts. That would be a start, but it will not be enough. Two other things are necessary. The first is that the CIO needs to mandate that the architecture group isn’t simply a resource. Their tools and methodology must be the only path to travel. I’ll explore this topic in more detail down the road, as I prepare for a course I will be teaching early next year. The other thing needed is a significant change in the perspective of the typical CEO. Many CEOs look at IT as simply a provider of widgets, and as the group that makes sure computers are on desks and that email is on. That is a fundamentally flawed perspective. As I sit here typing this on my iPad, and with an iPhone in my pocket, I’m led to reflect on the degree to which information technology has become ingrained in our daily lives. My devices help me find where I’m going, track my nutrition and exercise, allow me to communicate with others in a variety of ways, and help me stay plugged in to what is happening in the world. The devices have become integrated into my life. They improve it, and, yes, sometimes detract from it. But either way it has become integrated. Engineers and app developers all think about life processes and how IT might make them better. More and more frequently they re-imagine the processes themselves. The modern CEO needs to take this perspective and expect their IT function to engage at the level of the business processes. Not only enhancing them, but even rethinking them. There are two different models that come to mind to effect this. One is an organization where IT is centralized. All information systems are built and managed by this group and they provide resources for business design to each line function. The other is a more distributed design, where IT is responsible for processes and standards, but execution is embedded within individual business units. I will explore both of these models in the future, but in either one we see that IT is not primarily a technology implementer, they are a business process designer. Failing to make this philosophical change will always limit the possibilities for an organization. The CEO shouldn’t just visit his head of IT when his phone is no longer receiving email. He should visit him every time he is pondering the way his organization runs. The real problem is that we shouldn’t be having this conversation. Back in the mid-80’s (I think that is the late Cretacious period of computer science), I was an undergraduate TA in the UCLA Department of Chemistry and Biochemistry undergraduate computer lab. I was majoring in Biochemistry, but had fallen in love with computers in high school, like so many others in my age group. The professor in charge of the lab, Dr. Sandra Lamb, was continuously frustrated by the hesitance of so many professors to include computer science education in their curriculum. This was a huge problem among the biochemistry professors, and less so among the chemistry professors. Only one professor, Dr. Daniel Atkinson, who had published a book on using spreadsheets to model cellular metabolism, agreed with her concept. Fast forward maybe 10 years later, when I was setting up quality departments in the biotechnology sector. At that point, I was developing a significant amount of my own software, for document management, batch record management, etc., simply because it was impossible to manage the amount of work we had in a startup pharma company without the benefit of automation. It amazed me, at that point, as computer driven instrumentation had become the rule for the analytical lab, and was becoming the rule for the manufacturing environment (in my case it was the rule – all of our manufacturing processes were computer driven), how few people were coming out of the university system with any significant understanding of how computers operate. I had, by then, reached the conclusion that perhaps pure computer science wasn’t so important on its own, than having a robust computer science component within a science education. In fact, I think virtually all disciplines need this. Within the sciences, the ability to use a computer is absolutely required (and as someone who has managed support functions for a number of years, it is a sore point how many scientists can barely turn one on these days). However, the ability to make a computer work for you is frequently as important. So many science careers require programming at some level. Bio-statisticians need to program in SAS, S+, and R. Process scientists need to build complex models, coding in tools like Matlab. People in other disciplines need to know how to code and script their various management and analysis tools to get the most use out of them. In some cases, the lack of computer science knowledge simply means that a specific job may be out of reach (I can’t think of too many people in the bio stats field who can’t handle a reasonable amount of stats related programming), but in others it means that you have individuals who quite literally wallow in inefficiency. They don’t know how to code, so they do things the old fashioned way, waiting for someone who does know how to code to come along and rescue them. The time for that has come to an end. I somehow suspect that a large number of the computer science jobs represented in the above graphic are jobs where the ideal candidate would have significant knowledge in a specific arena, like STEM, but must also have the computer science background. 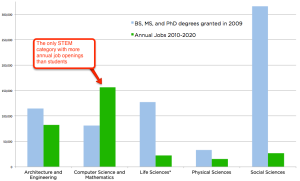 I suspect the same is true in the jobs listed within the STEM categories. We should no longer have the conversation of computer science vs. 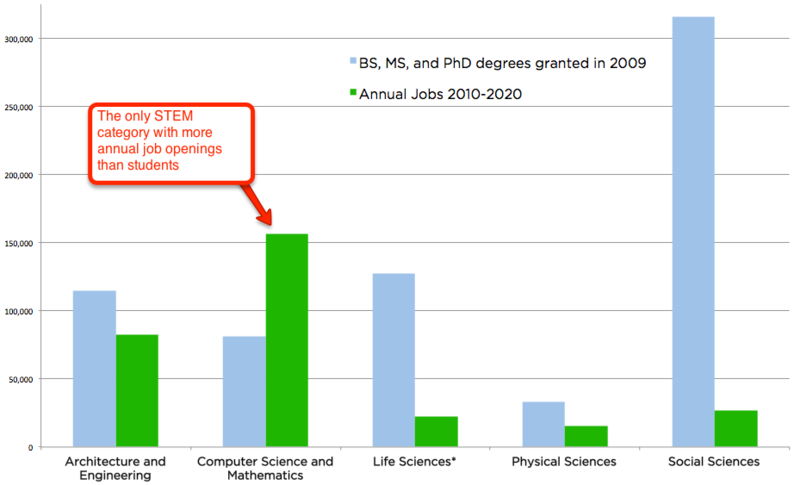 STEM, because we should no longer be graduating STEM students without significant computer science education. It boggles the mind that Code.org needs to exist. This is the 21st century, after all, and this conversation should have ended back in the 20th when I was in school. I love Code.org. I support what they are doing. I also look forward to the day, as I’m sure they do, that they no longer need to exist. Ever since the dawn of the computer age, we have been seeking a mythical computer utopia. A place where computers are truly an integral part of our lives and truly bring benefit to them. I’m reminded, to some degree, of the car in the Robert Heinlein novel “Number of the Beast” that was in virtual constant communications with its owners, was able to write its own programs, etc (It may have been more of a computer that had an interface in the car, I haven’t read the book in probably 30 years). Steve Jobs certainly had this vision, as is discussed in the book “Insanely Great”. However, there is always the sense that we haven’t quite gotten there yet. The ring is just out of reach. It is always dangerous to say that thus and such a technology will allow us to grasp the ring, so I won’t go there. However, I will say that Cloud technology has allowed us to move closer to the ring. We all think of the cloud as a way to store data or deploy applications outside of our own data centers, and that is still its primary objective. There is a necessarily positive side effect of doing this. That is, I can now access these applications and data from anywhere. When I started moving more of our functions into the cloud, it was, in part, so that our small team could function anywhere. It dawned on me this morning, that this, still, was only the tip of the iceberg. In fact, it is the ability to work anywhere, and on any device, that is key. I am working in my home office right now, with no devices that belong to my company. Yet, I needed to see what time a couple of meetings were today. I looked on my iPad (because it was the closest device to me and was open at the time). As I opened the collection where my calendar was, I was actually looking for a planner app I had been using a while back, but it wasn’t there anymore. I then remembered why. I had run across several planner apps that were something like the Covey planner system. I like the way they handled tasks and presented everything holistically. However, the bad ones were almost unusable, but the good ones used an independent system of tasks and reminders from the iOS ones. Suddenly, any tasks I created were only available on my iPad. I stopped using them. My calendar, however, is available on every device I own. From my office laptop, to my personal laptop, iPhone, iPad, you name it. So are my reminders. So are my emails. So these apps are actually useful because they allow me to have my data at the ready wherever I am. I’ll admit the most important device in this regard is my phone. Not because I use it for that much, I don’t. It is because it is the one device that is always with me. In order for this sharing of data between devices to work, the data must exist in the cloud somewhere. The alternative is to perform an inter computer sync, which was quite the rage for a while with different applications, but is beginning to go the way of the dinosaur. Calendar, email, tasks, etc., are all in the cloud for a lot of us. A growing number of applications will use a cloud file storage solution (Box, DropBox, Skydrive, etc.) as a backend. I use DropBox extensively in my personal life simply because it permits me to have access to a lot of information no matter where I am. Evernote is increasingly the poster child for this sort of functionality. As I’ve looked at applications for things like handwritten note capture, I’ve dropped a great number of them because they either don’t provide a seamless multi device utilization model. You see, the cloud allows our computers to be more integrated with our lives, and truly become servants. Although a legitimate argument can be made that computers have taken over our lives, I think that is looking at the situation incorrectly. When we had to go sit at a desk and fire up a machine, wait for the boot cycle, then dig for information in order to achieve our goals, we were slaves to the machine. Somewhat like Oliver Twist begging for more, we would approach the machines like they were our masters. Now, I expect my information to be at my finger tips when I want it, on my terms. A bit more like Downton Abbey, where I can pull a cord from whatever room I am in, and a servant will arrive ready to provide whatever I need. Applications that cannot perform this task are of no use to me, and must be banished. When I first began thinking about using the cloud, it was all about risk mitigation and cost management. Now, I see it more as how to enable computers to truly be integrated in our lives. The next step, is to begin to educate my user base on this, so that they can realize these benefits. After a week troubleshooting Solr and getting it running on Ubuntu for a test version of the Limspec app, I think I am allowed the bad humor. I recently posted a summary of how I deployed a Rails application on a Debian VPS using Nginx. The steps are fairly similar to what you would do with Ubuntu. For the Limspec project I’m working on, we’re using Apache – mostly because that is what I started with, but there is no practical reason to not use Nginx. The instructions in that post should work well, but you would need to install the mod_rails module for Apache and create the appropriate sites-available files. The application that I was deploying is a fairly simple application for my Church’s folk dance director to use for managing the dance program, and at this point doesn’t utilize any search, let alone full text, so the instructions didn’t include what is a fairly critical element to some of my other applications, and that is Solr for full text searching. Solr is from the Apache Lucene project, and is a very powerful enterprise search platform. I had implemented it for Limspec quite some time ago. However, we had a VM meltdown a few months ago, and the replacement VM only seemed to have pieces and parts from the previous VM. This was a huge problem getting Limspec deployed again (in addition to this, I no longer had root access, which is probably good as I was forced to set things up in a more secure fashion). When all was said and done, however, I had forgotten to check Solr out. It was working fine on my dev machine, so all search related tests passed with flying colors. Important safety tip with TDD. Even if you test exensively on your dev machine, you need to be very aware of those things that are deployed quite differently in production. Solr is one of those. Although it appears that you might be able to use the sunspot_solr gem in production, the developers who created it indicate they only intend it for use in development. After hours spent trying to make it work, I tend to agree. I could never quite get it running, so I finally gave up. So, not having taken notes on how I installed Solr the first time (well over a year ago), I set out to do it again. Of course, there is a newer version of Solr, and a newer version of the sunspot_rails gem. When I was rebuilding the actual Limspec server, I created an Ubuntu VM on my desktop to try everything on first. So, I continued to use that VM to figure out Solr. The following instructions are based on adding Solr to my local VM, which is running Precise Pangolin (Ubuntu 12.04 LTS). Solr is a Java servlet, and so needs a servlet container of some sort. Previously, I had used Tomcat. However, Tomcat is fairly memory intensive and is really only necessary for more complex Solr installs (such as multiple instance). Of course, if you are already using Tomcat for other purposes, it would probably make more sense to deploy Solr with Tomcat than to run yet another web server. If not, Solr comes complete with its own copy of Jetty. From here on out, everything is fairly straightforward, but it took me a while to figure it all out. The first step is to download the latest version of Solr, or at least the version you are interested in. I opted for 4.6, which is the most recent version at the time of me writing this. Once you’ve downloaded the tar file, you can untar it wherever you’d like, as you’ll be copying a subdirectory out to another location. There are a number of locations you can use as your Solr home. I recommend that you take a look ahead to the startup script from the Solr Wiki and choose one of the standard locations in the script. Remember that I’m looking to use Solr in support of another goal, so I want to minimize anything that makes my installation non-standard. Taking this approach, as well, makes maintenance of the application and installation by other users, much easier. I chose opt/solr as my home, so I executed a mv solr-4.6.0/example /opt/solr. or whatever names you chose. I tried to use names with spaces in them, and Jetty didn’t like that. I’m not sure if it was because of the spaces, or the fact that the name wasn’t the same as the instanceDir, so I just made them both the same and the problem went away. If you want to test your installation at this point, you can fire up jetty by running java -jar /opt/solr/start.jar. Then go to http://yourserver:8983/solr, and you should see both of your cores in the coreadmin screen. Note that you can change the port for Solr within the solr.xml file if you would like. The next thing you’ll want is for Solr to launch on startup in the background. This proves to be easy to do. First, download the jetty.sh script linked to from the SolrJetty page. If you looked ahead and parked Solr in one of the standard locations, the script will work fine as is. Place the script in the /etc/init.d directory and make it executable. Next, follow the instructions for creating the /etc/default/jetty file for the various parameters jetty will need on launch, setting the Jetty home Java home, jetty user, etc. as appropriate. If you opt to run it under a non-privileged user, such as solr (always a good idea), then follow the instructions on this page for creating the user and changing ownership of the solr directory. Also set the user name correctly in the jetty configuration file (/etc/default/jetty). Finally set the run levels. I just used the defaults (update-rc.d jetty.sh defaults). I should note that every linux command you see on this page, I preface with sudo, as I’m not operating as root. More than likely this will be your situation, or should be. I always prefer to bounce my server after making a lot of these changes, to make sure that everything will start as it should. So, I recommend doing that, then visit the solr admin page again to make sure everything is loaded. Next, make sure your sunspot.yml file located in <rails_project>/config is accurate with regard to port and path. One thing that wasn’t obvious to me, and sure is problematic is that the path is relative to the Solr directory. That is, if your Solr directory is /opt/solr, and your core is /opt/solr/solr/core0, then the path in the yaml file should be /solr/core0. The leading / is important as you will get an error otherwise. Finally, you will want to run a rake sunspot:reindex from within the your app directory. If you get one of those great rake errors about having the wrong rake running, do a bundle exec rake sunspot:reindex, and all should be well. I typically run a reindex on every deploy, just to make sure everything is good. Sunspot will only index new and modified database rows, so if you want pre-existing rows to be searchable, then you need to reindex. My next step is to run all of this on our production server. I’ll post back an update on how that goes. UPDATE: Ran this on the production server, and all worked as it should (provided you follow the directions, which I didn’t at first, but that’s another story). Recently, I’ve deployed different Rails apps to three different Linux servers from scratch. All three were virtual servers. Two were Ubuntu 12.04 servers using Apache. The most recent is a Debian server (version 6) running Nginx. Each server took progressively less time to launch, but with each one, I found myself grabbing bits and pieces from Stackoverflow.com, and other destinations in order to successfully complete my effort. So, I’ve decided to take the notes I made on this most recent deploy and post them here so that perhaps others will be able to benefit from my trials. For all of my basic websites and e-mail, as well as a couple of old Rails applications, I’ve used Dreamhost shared servers. For websites, this has worked out well, being a very cost effective means of managing websites. There has also been little downtime and few overall issues. However, with Rails, there is a major issue. While I understand the desire to avoid being on the bleeding edge with technology, Dreamhost has remained rather rooted in the distant past. I have long since ceased doing updates to my first application, the one I use to manage our parish bookstore, simply because I can’t move to any current gems or technologies. However, Dreamhost has a relatively low cost Virtual Private Server option, where you get a virtual server running Debian. There are various levels of configuration for the server, from situations where Dreamhost manages most of the major configuration options (web server, users, etc.) to where you manage it all. In the few days there are only two negatives with Dreamhost, and neither of them represent, in my judgement, much of a problem. The first is that you have to use Debian – there is no other option. The only other company I have to compare this to is Rackspace, where you have a wide variety of Linux flavors (and Windows for an appropriately larger fee). With Rackspace, however, there is a bit of an increased cost that comes with the flexibility. The other issue is around the chat support. With Rackspace, I tend to have a very capable technical person in the chat app in under a minute. With Dreamhost it has been 10 -15 minutes, and I’ll admit the quality of the technician isn’t as high. Nothing dramatic, but there is a level of you get what you pay for. While discussing hosts, I should mention my choice of code repository. I have opted to use bitbucket.org, an Atlassian product. Why? Well, free is the good part, but I also get to have the repository remain private. The only limitation I have is that I can’t move past 5 users. Well, since these are apps that I’m building myself, I doubt this will be an issue. You can, of course, use Github, but you have to pay to be private. I’m a huge Open Source fan, but I don’t necessarily want everything that I’m working on to simply be out there. At some point in the future, I may take some of these apps and make them publicly available, but I like being able to start with them privately. So, I provisioned the Dreamhost VPS and since I get a week free, I opted to max out the memory available for the server. This proves to be beneficial as some of the software installation processes get very memory intensive. Installing the Pasenger-nginx module will complain if you have less than 1024 Mb of RAM, and if your server doesn’t have that much, it will reboot in the middle of the installation process. I opted to deselect every “Dreamhost Managed” option, perhaps even when I didn’t need to, but I figured it would be safest to be able to do my own installations. This included selecting no web server to begin with. For most of the installation process, I followed the instructions at Digital Ocean. Yes, these instructions are for Ubuntu, but that is a Debian variant after all, so I didn’t run into any trouble. The only thing I did differently to begin with was to run aptitude update and aptitude dist-upgrade in order to ensure that everything I needed was available. I also opted to follow the RVM installation instructions from the RVM website for multiuser. I have, over time, found various sets of instructions on RVM installation, and have always found it best to simply go with the authors. Everything else installed as indicated (I did opt for Ruby version 2 instead of 1.9.3). I opted for Nginx in all of this for a couple of reasons. The first is that I really didn’t need all of the capabilities of Apache to run just Rails applications. Down the road, I do expect to use Solr, but I believe that the installation will build its own version of Apache. Nginx is also supposed to keep a relatively small memory footprint, which is important as I’m paying for memory, and it is supposed to be faster. I haven’t run my application on it long enough to decide, but time will tell. When you are done running the above instructions, it is likely that Nginx won’t work. 🙂 Surprise. I believe that the problem was I had residual Dreamhost Nginx pieces on my server, most notably the nginx init script from the /etc/init.d directory. For those who are very adept at fixing Linux scripts, fixing the one that is present isn’t probably very difficult. For my part, though, I just grabbed the script present on this page about setting up Debian and Rails. The script is not entirely robust, as I find myself needing to manually kill the nginx processes if I need to restart them, but that isn’t much trouble and I’ll likely fix this later. Outside of making the script executable and ensuring that it runs at startup, I mostly ignored this page. A lot of it is because the default Debian install from Dreamhost has much of it taken care of. The other issue has to do with RVM. I’ve long since learned the advantage of using RVM, so manually installing Ruby seems like a bad idea. There are some other interesting looking parts on that page, so I suspect it is more useful in general than I took advantage of. After making these changes, Nginx just… didn’t work. The problem was with the log files for Nginx which were all owned by root. Seems like a bad idea. I modified /opt/nginx/conf/nginx.conf to run as www-data then changed the log file ownership appropriately. This is user is very much unprivileged in the system, and so seems like a good choice to run nginx as (Apache defaults to this to, so it should seem familiar to people who have worked with Apache). MySql installation was amazingly painless. I’ve had problems with it before, but I followed the instructions from cyberciti.biz, and all was happy. A lot of what I’m going to say here will likely result in a bunch of face palming by more talented developers than I, but since I’ve not done a lot of new deploys in the past, I still trip over amazingly trivial things, so I figure (hope) I’m not alone in this. The first bit is to remember to generate keys on both your development machine and on the server and provide the public keys to bitbucket, so you can download the source code during the deploy process. BTW, I use Capistrano for deploying my rails apps, as I find it easier for doing updates. Frankly for an initial install, I don’t think it helps too much, but down the road you’ll be happy if you use it. When you create the keys on your server, make sure you do not use a pass phrase. Although the server will ask for your passphrase during the deployment process, Capistrano doesn’t seem to actually transmit it, so your deploy will fail. Also, don’t forget to run cap (stage) deploy:setup. I always forget to do that on first install, then watch it fail as the target directories don’t exist. Before you do the deploy, however, you should change the /var/www directory to be owned (chown www-data:www-data) and writable (chmod g+w) by the www-data group. I should have mentioned that my deployment server user is a member of www-data. This makes it easier to make changes during the installation process. Turns out that giving global www-data too many privileges is not wise. Plan on running the rails application under a dedicated service account and give that account permissions to the appropriate folders for running the application (typically you just need public, tmp and log directories and their subs, as well as any custom directories you need to write to). The installation can run using your user account. Another problem was with using Zurb foundation. Since the foundation css file doesn’t actually exist, the application will not run when you access it from your web browser. So, it is necessary to run a bundle exec rake assets:precompile at the end of your installation. Apparently you will also need the compass gem in your gem file ahead of the foundation gem. Finally, if you are running multiple stages on your server (I have a staging, um, stage, for testing new stuff out with users) you want to make sure the RAILS_ENV variable is properly set. You can follow the instructions at the mod rails site for doing this.